All kinds of meat, whether beef or pork or lamb, are excellent sources of protein and make the kind of filling dishes traditionally regarded as ‘proper meals’ for the end of a hard working day. The increased interest in healthy eating, however, has expanded our ideas of what constitutes nutritious food and certainly supermarkets and butchers alike now offer special cuts of lean meats. Allow a portion size of roughly a 175 gram serving of meat for an adult and aim to work as many low calorie vegetables as possible into the recipe, with a modest serving of starchy foods like rice or potato. As a variation on peppered steak, the peppercorns in this recipe flavour the sauce rather than the steak itself. This has 260 calories per serving. Trim excess fat from the steaks. Place a little of the fat into a non-stick frying pan and cook over a medium heat to release some juices, then discard the fat. Raise the heat to high, frying the steaks for 2 minutes each side. Reduce the heat and cook for up to 2-3 minutes more on each side. A total cooking time of 8 minutes will give a well-done steak; reduce the cooking time by half for rare meat. Remove the steak from the pan and keep warm in the oven. Chop the shallots finely and add to the pan juices, cooking over a low heat. Stir the shallots until lightly coloured then add the peppercorns, mustard and brandy. Stir in the yogurt and lemon juice. Heat gently and serve with new potatoes and a salad or crisp vegetables. This low calorie meat recipe is a healthy 214 calories per serving and is rich in nutrients from the vegetables. Serve with baked jacket potatoes. Make sure the jacket potatoes are baking in the oven in good time. For the sauce recipe, peel and chop the onion and garlic. Deseed and dice the bell peppers. Trim and dice the courgette. Wipe and halve the mushrooms. Place all the vegetables in a saucepan and stir in the chopped tomatoes and tomato puree. Add the dried herbs, sugar and plenty of seasoning. Bring to the boil, cover and simmer for 20 minutes. Meanwhile, preheat the grill to medium. Trim away any excess fat from the chops. Season them on both sides and rub in the mixed herbs. Cook the chops for 5 minutes, then turn over and cook for a further 6-7 minutes or until cooked through. Drain the chops on kitchen paper and serve accompanied with the sauce and baked potatoes. 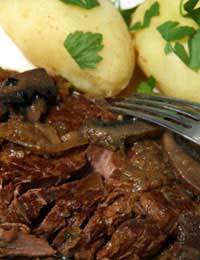 If you would like to try something different this meat recipe uses venison, at only 174 calories per serving, and may fit the bill. Trim the spring onions and cut into bite-sized pieces. Halve and deseed the pepper and cut it into bite-sized pieces. Top and tail the mangetout and trim the baby corn. Trim away excess fat and cut the meat into thin strips. Heat the oil in a large frying pan or wok until hot and stir-fry the meat, garlic and ginger for 5 minutes. Add the spring onion, pepper, mangetout and baby corn to the pan, then add the soy sauce, vinegar, sherry and honey. Stir fry for 5 minutes, keeping the heat high. Carefully stir in pineapple pieces and bean sprouts and cook for a further 1-2 minutes to heat through. Serve with freshly cooked rice and extra soy sauce for dipping.